I have recently finished my week of chasing with Erik Burns and Tornadic Expeditions, and what a week! We had some something in the vicinity of 20 tornadoes on three different days. I have never experienced a weather setup this great and, as far as I understand, very few has! Obviously, I am very happy with the week. Erik just started his tour company I was participating in his first tour week ever, together with David from Buffalo, NY. Erik’s goal with Tornadic Expeditions is to have a very personal storm chasing experience and it really is. It was very personal and very far from the bigger storm chasing tour companies who can have up to 15-20 people on the same tour. When I review how good a certain tour company and tour guide I try not to be biased by how good the weather setup was, since it is nothing the tour guide can actually affect. I have been on tours with no tornadoes reported at all during the entire week and now this one with tornadoes on storms every day of the week. I believe it is fair to review the tour company according to how well they perform with the given setup. First of all, Tornadic Expeditions is run in a very comfortable Toyota van. Since we were only two people on the tour we could spread our stuff out in the entire van which was very convenient (although this will probably not be the case in future tours). The seats are very comfortable and the van is arranged with a screen in the back so you can see everything that Erik is looking at on his computer, which some but not all tour companies have. This is very useful and makes you more involved in the chase. The downside of the vehicle is that the setup of some inside features makes it a bit difficult to look outside, especially forward. The view is blocked by a camera setup and the fact that the wind shield is quite low. This did in fact make me miss out on one brief tornado completely and much of the first tornado we saw. It was annoying but not much worse than the view from most other tour companies I have been in either. The inside of the Toyota van with the screen where you can see radar etc. The orange/black camera setup is mine and not the normal setup. Compared to other tour companies we tended to stay in hotels of higher quality than what I am used to on other tours. This was highly appreciated by me and David! In terms of forecasting skills and finding tornadoes I believe Erik is very skilled. It was obvious when we caught the amazing Dodge City tornado outbreak where he spotted the boundary rotation and predicted a tornado outbreak one hour before it happened, convincing his chase partners to go for it when they were quite reluctant to change target. We also missed a few tornado targets but that always happens. Tornado chasing is just like baseball in that sense. No batter hits all the balls and no tour guide will get on all the tornadoes. We did however miss out on the 90 minute Chapman-tornado which was a huge bummer, both for Erik and us. Many seasoned chasers, and even SPC, missed it in the forecast and nowcast. When you experience busts like this, it is always painful but I would have wished for some more leadership in terms of looking at the situation on a more positive and progressive side when it happened. It would have made the situation less painful. We did, more importantly, get to experience the Dodge City-outbreak which I will be forever grateful. In addition to that we also had a very exciting close encounter with an EF0 tornado at Leoti, KS, and saw a nice wedge tornado together with some smaller spin-ups in Texas. Erik did great in terms of finding tornadoes. As a tour guide Erik is very energetic, emotional and caring. He truly loves chasing and that love is contagious. Chasing with him is very much like just coming along on a chase with a veteran chaser and experience his storm chasing style, rather than going on a tour. One thing both me and David was concerned about however was the attention to driving. He did, like many tour companies where the tour guide is also the driver, have to focus a lot on the GPS, the radar and, at times, on the tornadoes. I have seen this problem in previous tours as well. Still, it is something that made us both very nervous and something we brought up with him. For next season he mentioned he will consider hiring a driver to remove this problem. 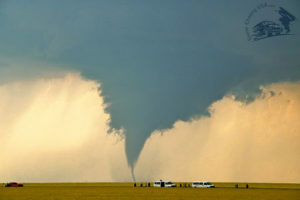 All in all, I think there is a few things that can be improved and could have been handled batter but my general feeling about Tornadic Expeditions is that I can highly recommend choosing Tornadic Expeditions for your next storm chasing tour. The things that were not so great seemed to be things Erik will be dedicated to work on for upcoming tours and, after all, this was his very first tour as well. I am very grateful to have been a part of this week and to have experienced the best chase day of my life, thanks to Erik and Tornadic Expeditions.